Copyright 2017 John Wiley & Sons, Ltd.
Clear, degradable polymer films are used with agricultural crops to alter the germination and growing environment, and extend the length of the growing season. The film acts like a greenhouse, elevating temperatures and improving soil water. We examined the potential of polymer film to improve emergence and persistence of direct-seeded native vegetation. A seed mix comprising three tree species and two shrubs was sown in early August 2015, with and without polymer film. 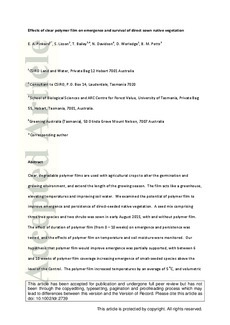 The effect of duration of polymer film (from 0 – 10 weeks) on emergence and persistence was tested, and the effects of polymer film on temperature and soil moisture were monitored. Our hypothesis that polymer film would improve emergence was partially supported, with between 6 and 10 weeks of polymer film coverage increasing emergence of small-seeded species above the level of the Control. The polymer film increased temperatures by an average of 5 °C, and volumetric water content by 3%, compared with ambient conditions, and reduced fluctuations in soil moisture, which may have contributed to the increased emergence observed. Emergence was low across all treatments (range 0.2 – 47%). Our hypothesis that polymer film would improve persistence was not supported, with seedling numbers declining rapidly following removal of the polymer film and no differences between treatments in percentage persistence by the end of the experiment. We concluded that polymer film is a potentially useful tool for improving emergence of smaller-seeded species in direct seeding for land restoration, although provided no benefit for emergence of the larger-seeded species.